High Roof Panel Van Rental – The high roof panel van is the perfect panel van for the television and film industry, it has enough space inside to walk and can be used as a wardrobe van or camera van easily. The vehicle has seating for 3 people on the front seat and the rear is enclosed for easy and safe transport of goods. 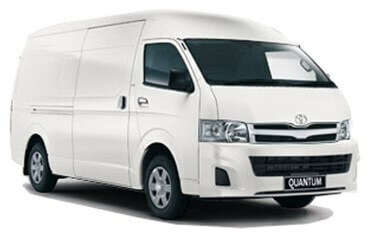 The Toyota Quantum LWB (long wheel base) panel van is the industry standard, and has plenty of space for goods to be loaded in the back, and there is space for an average man to walk upright in the back, if you would like to use it as a working space while the vehicle is parked. Pace stock both the diesel and petrol versions of this vehicle with air-conditioner so your team can keep cool while they do their work, in their van rental.